VLCC Manicure Pedicure Kit is designed to help you get beautiful, healthy tips & toes. This kit helps maintain healthy nails, cuticles and supple skin on hands & feet. A Combination of unique products enriched with goodness of natural ingredients. It cleans, soothes, lightens and brightens the skin on hands & feet. Pediglow Hand & Foot Cleanser (50 ml) : This cleanser with the goodness of soapnut & margosa removes deep-seated pollutants from the pores and softens thick tissue. It also fights hand and foot infections and harmful germs. Myrrh Cuticle Oil (10 ml) : This cuticle oil with the uniqueness of myrrh and almond oil provides nourishment, makes the skin smooth, supple and wrinkle free. Pediglow Hand And Foot Scrub (50 ml) : This luxurious scrub enriched with walnut and lemongrass, helps in gently and effectively removing dry, dull and dead skin. Walnut shell powder exfoliates dead tissues while lemongrass stimulates blood circulation. Cocoa Butter Hand And Foot Cream (50 ml): An ultra softening cream with cocoa butter and orange oil. A complete reviver made of unique herbs, that nourish your hands and feet. Orange Anti-Tan Pack (50 ml) : This unique formulation, enriched with orange peel extract and vitamin e that brightens, lightens and even dull, patchy and damaged skin. It also helps lighten the tanned skin. Additional Information: With the motto of Transforming Lives'VLCC aims to spark self-transformation, spread happiness and imbibe every individual with wellness. It is widely recognized for its therapeutic approach to beauty and weight loss solutions. Started in 1989, VLCC has now expanded its horizons to skincare, hair care, body care, functional foods and fortified foods products. Explore the entire range of Manicure & Pedicure Kits available on Nykaa. 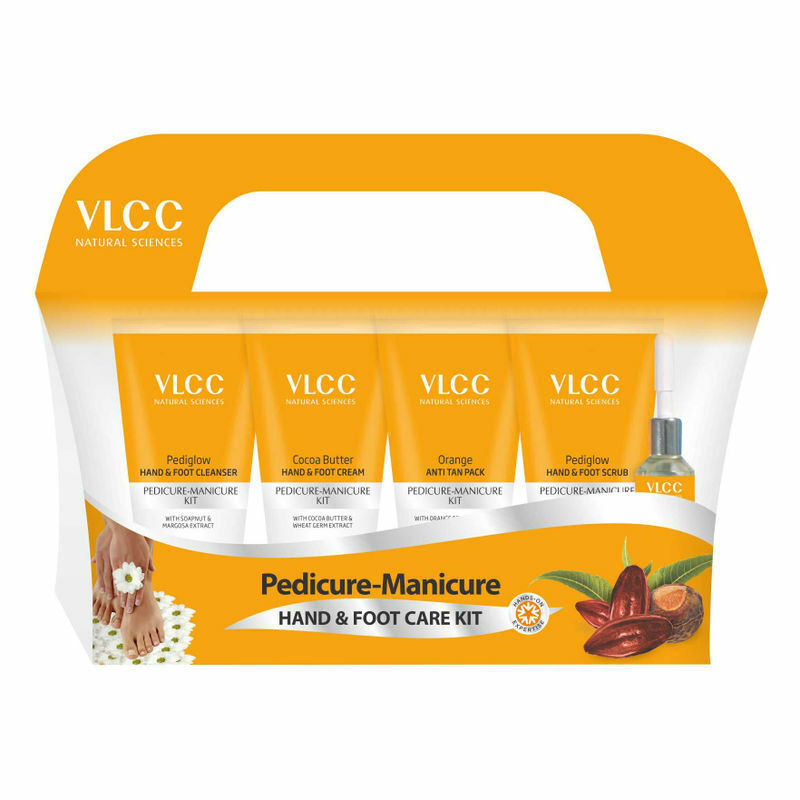 Shop more VLCC products here.You can browse through the complete world of VLCC Manicure & Pedicure Kits .